The Cup has long been Upper Deck's defining Hockey product. It has supplied Deck Hockey fans with the most cherished cards in their collection. 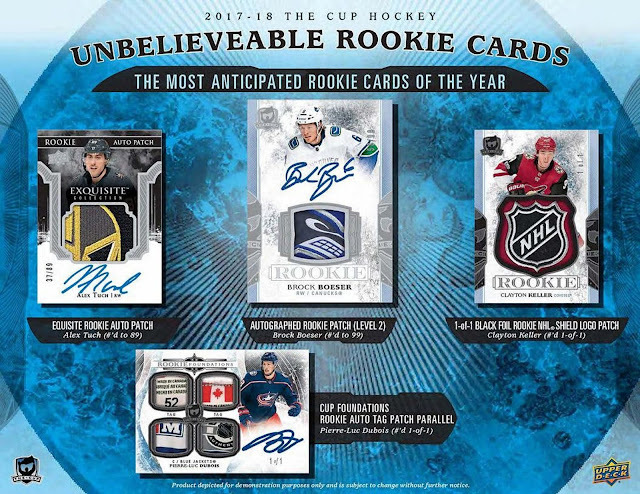 Sports Cards Plus was allocated 9 boxes of The Cup and these won't last long. Innovation in the trading card industry is difficult. We are already three decades into the modern era which to date has been defined by big chase cards sporting every attribute imaginable so bringing something truly fresh to the market is a daunting task. Autograph and memorabilia cards have been the primary drivers for high-end chase cards for approximately 20 years now. The sports card market in particular has greatly benefited from being able to get the greatest athletes on the planet to sign trading cards. We’ve seen, however, that even autographs can suffer from the adage that “too much of a good thing” is not such a good thing. 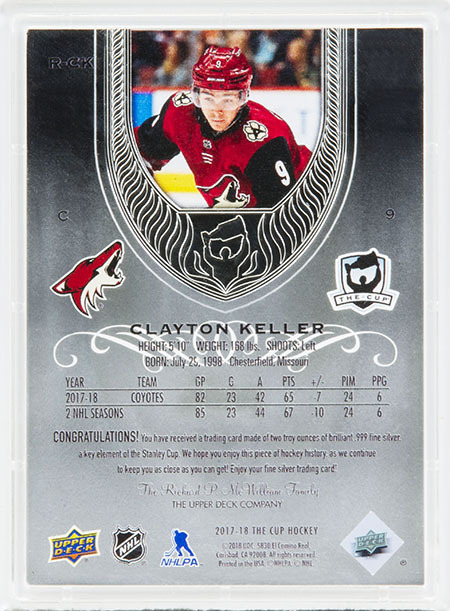 To that effect, for many years now, the Product Development Team at Upper Deck has been focused on creating high-end chase cards that have value without the use of autographs or memorabilia. 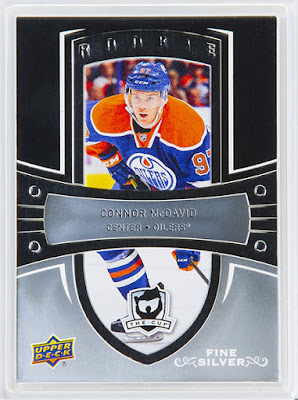 Within the hockey card market, Acetate Young Guns, Black Diamond Rookie Diamond Relics, Ice Premieres Rookies and SP Authentic Spectrum FX Bounty cards are all highly desirable chase cards that drive collector interest without relying as much on autographs or memorabilia. 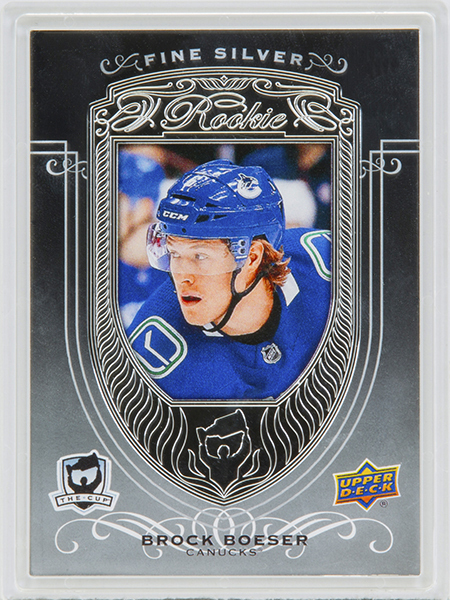 With the forthcoming release of 2017-18 NHL® The Cup hitting the Sports Cards Plus shelves on Wednesday, October 24, Upper Deck is excited to announce our newest innovation for the sports card market: Fine Silver Rookies and Fine Silver 2005-06 Retro Rookies. 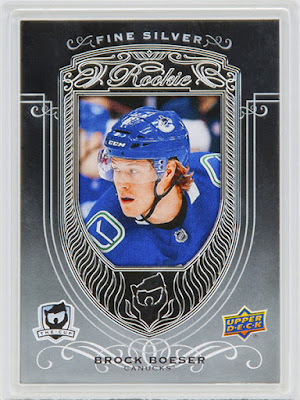 Limited to six superstar subjects per set (true rookies for the Rookies set and veterans pictured during their rookie season for the Retro set) these cards – each crafted from two solid ounces of pure silver – are immediate contenders for some of the most visually spectacular cards Upper Deck has ever produced. These collectibles were encased in airtight holders immediately after minting to avoid oils from the human hand transferring to them. Though print runs will not be released for these cards, it is safe to say they are truly unique and rare cards. We hope these exciting new super-premium chase cards add some sizzle to the already exciting experience of opening a tin of The Cup. For the lucky customers who discover one of these rare gems, we hope to have delivered a new centerpiece to your collection, and find memories to share with family and friends. 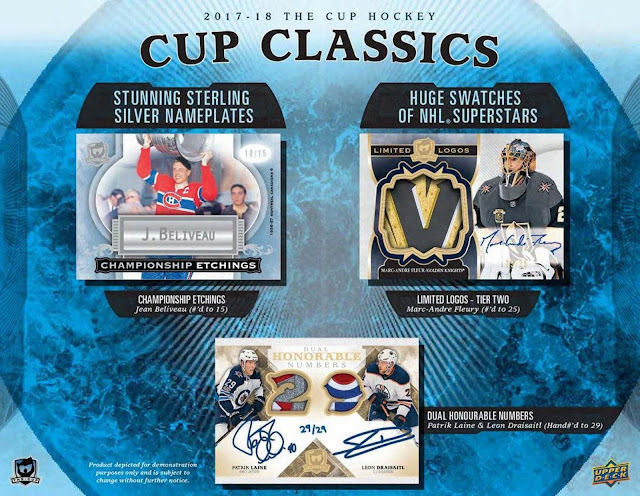 Minted specifically with the collector in mind, Fine Silver collectibles await those who open 2017-18 NHL® The Cup!